Ultra micro fiber suede, 3mm, flat, 9 feet, red. Frabels Inc.
Ultra micro fiber suede, 3mm, flat, 9 feet, red. (SKU# TTU3MMFS/RED). Sold per pack of 1 spool(s). 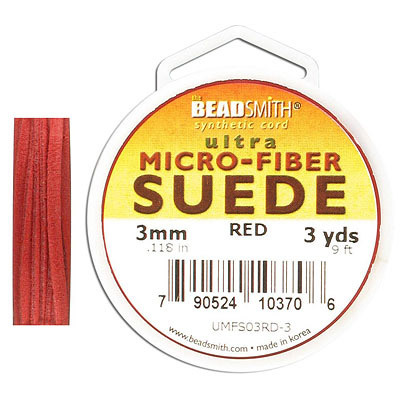 Ultra Micro Fiber Suede is a specially treated synthetic material which is a fantastic alternative to real suede cord. It is more flexible, incredibly soft, yet strong and durable, and it's washable.